PfUG v.2.2: Building in Pfhorte! Using Pfhorte! is very similar to drawing in one of the popular 'vector graphics' drawing programs used by graphic's professionals--like Macromedia FreeHand, Adobe Illustrator, or Corel Draw!. All your drawing is based on 'points' and 'lines'. When you select the Polygon Tool, and click once on the Map Window, a point appears where you click. Moving the mouse after you create a point will show an elastic 'line' which follows your mouse around the screen, growing and contracting in relation to the first point. When you click a second time, the line between the first two points solidifies, and you again have control of an 'elastic' line anchored at the second point you created. This process is repeated until you double-click, or until you click on the original point. When you do that, you've created a very important element of Marathon map--a polygon! Marathon's basic "building block" is the polygon (or 'poly', as you've probably already gathered). Every map is made up of dozens and dozens of polygons connected together to make hallways, rooms, etc. Because of the way Marathon's engine operates, a Map is designed in 2D. You cannot "model" a three-dimensional room by creating a 3D cube and sticking other 3D cubes onto it or inside it, as you would in a 3D program like InfiniD or Ray Dream Designer. Instead, you create polygons outlining a room's boundaries, or walls. You then tell Marathon the height of the floor and the height of the ceiling. You link these polygons together, creating pseudo-3D structures by defining different floor and ceiling heights. Ledges are simply polygons whose floor heights are higher than the rest of the room. Staircases are hallways whose floor heights go up or down. Platforms and doors are "special cases"--regular polygons whose ceiling heights and floor heights can change dynamically. 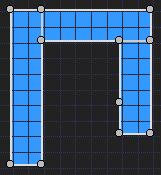 A door, for example, is just another 2D polygon in a map, connecting two larger rooms. But when you are playing the game, and you walk up to a 'door', and hit the action key, its ceiling height changes and it appears to slide upward, allowing you to pass. Polygons must always have between 3 and 8 sides. They also must be drawn in a clockwise fashion, and in such a way that all interior angles are less than or equal to 180 degrees and greater than 15 degrees. Fortunately, polygons can be connected together along their sides. Only two polygons can be connected together along any one side. This means that you cannot have a room connecting along one wall and another room or window higher up on that same wall. When two polygons are connected, the wall between them is not drawn so that the player can walk and shoot between polys. If the floor height or ceiling height of the polygons are not the same, then small walls will fill in those gaps in elevation and still leave an opening between the polygons. This is how stairs or windows are made. Each polygon also has a separate floor light and ceiling light. For more explanation on lighting types, and how to set them, see the section on 'Lighting'. Pfhorte! also allows you to make polygons with more than 8 points and it will automatically split this polygon up into smaller connected polygons for you. Double clicking on a polygon brings up the Edit Polygon dialog. Here you can change most of the characteristics of the polygon. A small image of the polygon is shown with each side numbered. For sides that are walls you can click on the edit button for that wall to bring up the side editor dialog. You can also click on the 'Solid' check box to have a non-existent wall (window) repel shots. the VERY same space in the "world." the same space in Marathon's "universe." elevation of one of those rooms, though? the Marathon engine turns them into 3D rooms on different "floors" of a structure. Your character is roughly 819 units tall. Making rooms shorter than this will keep your character from entering those rooms normally. The highest you can normally step (for stairs, etc.) is around 345. I say normally in all my size quotes because by playing with the physics editor you can change a number of these constants. physics module can affect all these parameters. These are the various types of polys which can be used in Marathon. You can set the type of the poly in two places: the Edit Polygon dialog (brought up by double-clicking on the poly), or the Inspector palette (when a poly is selected). Normal: This is your average hunk of floor/ceiling etc. Item Impassable: Randomly placed items will not appear in these polygons. Monster impassable: Monsters generally stay out of these squares. They will follow you through them, however. Major Damage: Will cause very rapid damage to a player in this poly, and will make it difficult to see. Minor Damage: Will cause slow damage to a player in this poly, and will make it difficult to see. Platform: A door, elevator, trash compactor, etc. See the section on Platforms for more information. Light on/off: Sets a poly so that stepping in it will turn a light on or off. Option-drag on a poly with this setting to define the poly whose light level is affected. Platform on/off: Sets a poly so that stepping on it turns a platform on or off. Teleporter: Will send you some where else only if you stop on this poly. If you keep moving, you don't transport. You can Option-drag on this poly to determine the destination poly of your teleport. Glue Trigger and (Super) Glue: These settings are used to set triggers, which activate aliens, or boundaries for triggers, defining which aliens you activate. sent from one to the other. best results, that no aliens are placed directly on the SuperGlue polys. either side by SuperGlue polygons, to prevent anything else from being triggered. on, with one exception: if they can see what's happening, they will come anyway. activate until P leaves the room and enters the corridor. next room where they are until the player enters their room. &#0;Must be explored: When Exploration is checked as a goal in the Mission Info dialog, this (or these) polys must be crossed by the player to be able to exit the level. Exit: Going to a polygon with this setting after completing the goals for this level will teleport you to another level. The level you are teleported to can be entered in the Edit Polygon dialog box (which can be reached by double-clicking on the 'exit' polygon). Pulsate: The textures seem to move in an out, as if they were breathing. Wobble: The texture moves from left to right. Fast Wobble: The textures move from left to right REAL fast. Note: When static is used on floors and ceilings it dramatically slows down play speed. background seen outside the ship. Fast Horizontal side: Same as above, but faster. Vertical Slide: This option causes the texture to scroll from top to bottom. Fast Vertical Slide: Same as above, but faster. Fast Wander: Same as above but faster.